A new BBC television series starts next Sunday, tracing the evolution and origins of our own human species Homo sapiens. The programme will chart the evolution of mankind and the progress of our species out of Africa and their migration and eventual colonisation of the world. Presented by Dr. Alice Roberts, an Anthropologist at Bristol University, this documentary series shows how our species, so few in number after a period of climatic change, managed to cling on and eventually to become the dominant large species on planet Earth. The faces of some of our human ancestors are dramatically reconstructed using techniques akin to forensic science to literally “flesh out” fossil skull bones of our ancestors and bring them back to life as highly realistic three-dimensional sculptures. For example, the face of the first anatomically modern human to live in Europe has been re-created for the series. Although from the fossil fragments found to date, it is impossible to ascertain whether this was a man or woman, the fossils have been dated to around 35,000 years ago and this ancient human would have shared the world with another human species – Neanderthals. The person responsible for the re-creation is forensic artist Richard Neave, who used copies of fossil human bones found in a cave in the Carpathian mountains to build up the facial features of this early European. Human fossils are very rare and only partial skull material and part of the jawbone were available to work with but using these items and other supporting material, slowly and surely Richard was able to bring back this ancient person. From the reconstruction, it appears that the facial features indicate a close affinity to African ancestors. This human clay model was built up using the same processes as found in the Everything Dinosaur Neanderthal Skull kit, a forensic science kit that enables young scientists (from aged 8 to 80) to build their own forensic model, but this time of a Neanderthal from 50,000 years ago. Richard Neave, the forensic artist who reconstructed the facial features in the TV clay model, based his assessment on a careful measurement of the bone fragments and his long experience of how the soft tissues of the face are built around the bones of the skull. This forensic peg sculpture kit comes complete with skull kit, moulded pegs, modelling clay, rollers, sculpting tools and display stand. Detailed assembly guide, instructional DVD plus Neanderthal Man fact sheet. Sales of this product support the Natural History Museum – London. The kit is based on the fossils of a real Neanderthal, a man who lived in France approximately 50,000 years ago. Forensic artists like Richard Neave, are able to create realistic peg sculpture models of ancient hominids based on their knowledge of human anatomy and the clues they find when fossil skull bones are closely examined. Unfortunately, it is impossible to say whether the ancient European re-created for the BBC had a dark or pale skin. It is likely that he or she was quite dark skinned, with later generations slowly losing their dark skin pigment as they adapted to colder climates with less strong sunlight. “It’s really quite bizarre. I’m a scientist and objective, but I look at that face and think ‘Gosh, I’m actually looking at the face of somebody from 40,000 years ago’, and there’s something weirdly moving about that”. A team of potholers discovered the lower jawbone of the first modern European in 2002 in Pestera cu Oase, the “cave with bones”, located in the south-western Carpathian mountains. The remaining fragments of skull were unearthed the following year as other parts of the cave were explored. The cave also contains a lot of bones of the Cave Bear (Ursus spelaeus), a large omnivorous bear that would have been a formidable animal for our ancestors to confront. Scientists have dated the human fossilised bones from the cave using radiocarbon analysis to between 34,000 and 36,000 years ago when Europe was occupied by both Neanderthal man, who had lived in the region for tens of thousands of years, and anatomically-modern humans – Homo sapiens – who had recently arrived on a migratory route from Africa via the Middle East. Although the skull shares many modern features of human anatomy, it also displays more archaic traits, such as very large molar teeth, which led some scientists to speculate the skull may belong to a hybrid between Homo sapiens and Neanderthals – an idea discounted by other experts. The large molars may be an adaptation to the harsher diet of our ancestors, rather than direct evidence of a close affinity with Neanderthals. What is known from chemical analysis of fossil modern human and Neanderthal bones is that these two species had different diets. Neanderthals ate more meat than our direct ancestors. 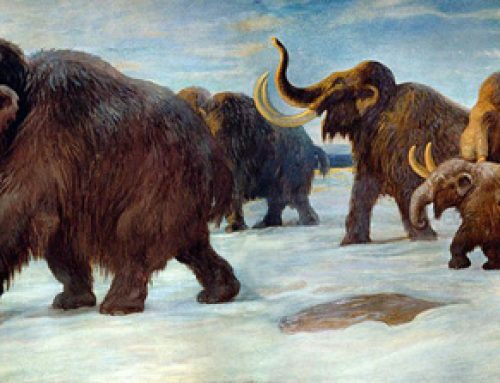 Homo sapiens seems to have been more of a generalist; eating a wider variety of food items, and subsequently less dependent on large animals such as Mammoths and Woolly Rhinos for food. Perhaps our more varied diet and less dependence on the mega fauna is one of the reasons why this programme aired on BBC 2, Sundays and repeated the following Tuesday is presented by a Homo sapiens and not a Neanderthal.